TERMINAL TACKLE → Hooks → Treble → Mustad KVD Elite Triple Grip Treble 11ct. Mustad KVD Elite Triple Grip Treble 11ct. 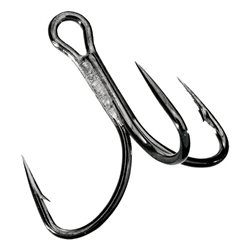 Mustad's KVD Elite Triple Grip trebles are the hook of choice for power applications. They have opti-angle needle points, chemically sharpened, nor-tempered, 2X short shank, extra strong, special wide bend, and ringed.